I love the Rotary and all it stands for. Businessmen and women coming together to help the community and those in need. On my ride through Kew, just south of London, I realized my rear tire was going flat. 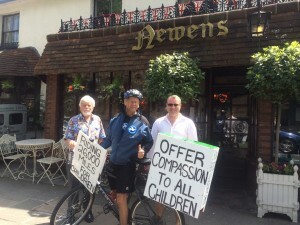 Climbing off the Kindness Bicycle I heard a voice, “Are you part of the Rotary?” Richard Ward belonged to that voice and after a brief conversation I was invited for tea to meet another Rotarian, Dean, who owns the Maids of Honour tea room and Newans Bed & Breakfast. In the hour or so of sharing stories, I was invited, if need be, to stay in a spare room at both of their homes. This is what members of the Rotary are known for. This entry was posted on Thursday, June 12th, 2014 at 6:26 am	and is filed under Kindness. You can follow any responses to this entry through the RSS 2.0 feed. You can leave a response, or trackback from your own site.